The X-Ray Of The Future Is Finally Here! X-rays. You know them, right? Those high-contrast black-and-white images that let doctors peek inside our bodies without cutting us open or using a tube/camera of some sort. They are useful for all sorts of things such as spotting broken bones, cancer, and other abnormalities in the body. After more than a hundred years of x-rays staying the same, they are getting a major upgrade. Traditionally, having an x-ray taken was simply a matter of bombarding a person with x-rays. To get a little science-y, an x-ray is an electromagnetic wave with a wavelength shorter than visible light, so it can pass through soft tissue (like skin and flesh) but not through bones. A New Zealand company called Mars Bioimaging have come up with a new kind of medical scanner. The technology is based on other tech developed at the Large Hadron Collider in CERN, Switzerland. The new imaging technology has a chip called the Medipix3 which works a bit like a digital camera in that it has a sensor that detects and counts the particles hitting each pixel when the shutter opens. 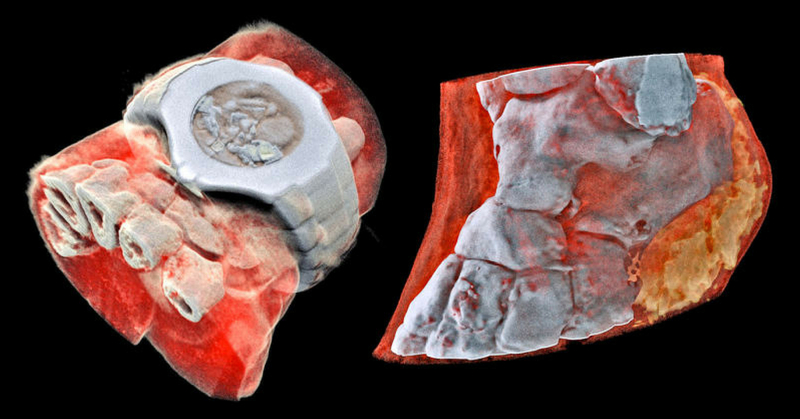 When the data picked up by the Medipix 3 is run through a data-processing algorithm, the scientists are able to discern the different materials the x-rays pass through. To put it simply, before, all we got were either soft tissue (which was black) or hard objects (which was white). Now, a computer is essentially able to detect the tiny changes when the x-rays go through you and differentiate between skin, flesh, bones, and anything else that might be in there. What this means is that if a doctor is looking at a broken arm, they can also potentially see other medical anomalies while looking into it. Don’t expect a scifi visit to the doctor any time soon though as the technology still needs several clearances and approvals before it is made commercially available. However, clinical trials are beginning in New Zealand soon, meaning that we are one step closer to this tech being available in hospitals.